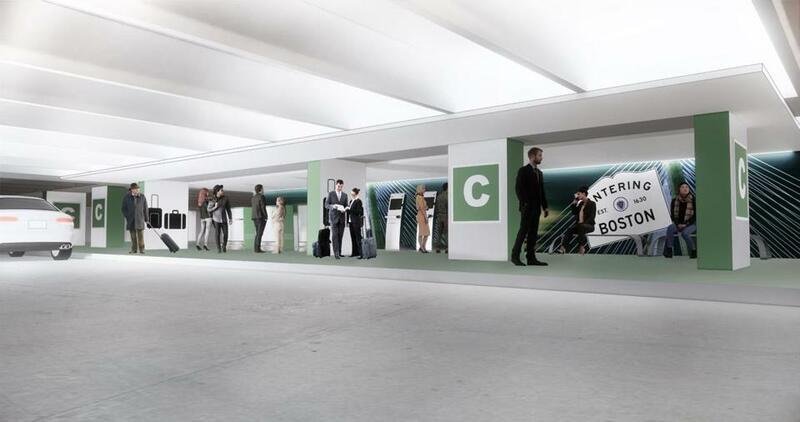 A rendering of a proposed idea for new pickup and drop off areas at Logan Airport. 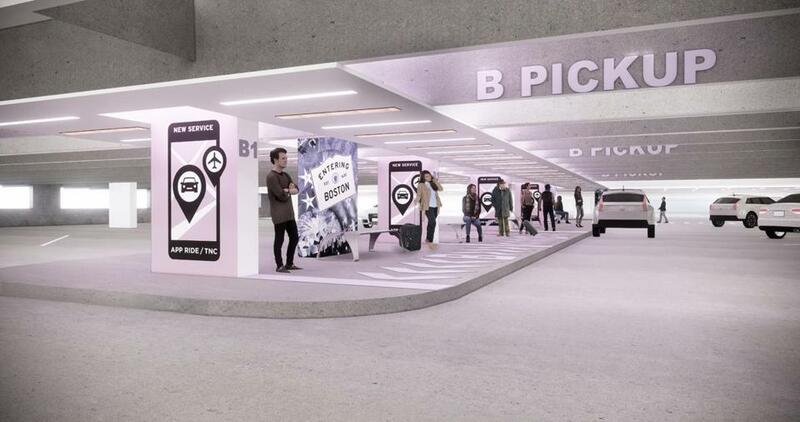 The Massachusetts Port Authority is showing no sign of backing off its plan to ban Uber and Lyft from curbside drop-offs at Logan International Airport, pushing ahead on moving all trips to a central parking garage. As if to stress the need to more tightly control the services, Massport on Friday released data showing that ride-hailing trips at the airport were up nearly 30 percent in the first three months of 2019 over the same period a year ago. Officials say that coordinating all pickups and drop-offs at a central location would reduce congestion outside the terminals, as well as the number of Uber and Lyft drivers who leave without a passenger, gumming up airport and East Boston roads. 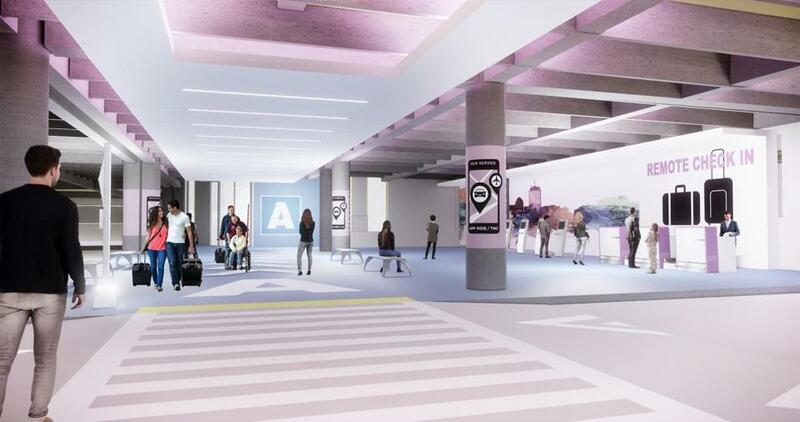 The agency also released images of its proposed ride-hailing area, depicting the garage space, about a five-minute walk from the terminals, as brightly lit with benches, check-in kiosks, wheelchair assistance, and baggage checks. Under state law, Massport is allowed to establish its own fees and rules governing ride-hailing systems. The proposal would increase the fee for ride-hailing pickups from $3.25 to $5, and establish a new $5 fee for drop-offs. It would also encourage car-pooling by discounting fees for shared rides. Massport board members are expected to vote on the proposal later in April. Both Uber and Lyft have panned the Massport proposal. Uber has argued it can already match passengers and drivers more easily to cut down on empty trips, called “deadheads,” without sending all passengers to a central location; the company has also called on Massport to keep the pickup fee stable while instituting a new $3.25 drop-off fee. On Friday, Uber also noted that Massport’s proposal would make Logan’s combined pickup and drop-off fees among the highest in the country; the gap between ride-hailing and taxi fees at Logan would also be the largest among US airports, Uber said. Uber spokesman Harry Hartfield urged Massport to consider its counteroffer. The latest flare-up in the spat came one day after Uber filed its first public document in its transition to a publicly traded company. In the document, Uber said airport trips account for about 15 percent of gross bookings. And without citing Logan specifically, it described rule changes such as those at the Boston airport as a business threat. “If drop-offs or pick-ups of riders become inconvenient because of airport rules or regulations, or more expensive because of airport-imposed fees, the number of Drivers or consumers could decrease, which would adversely affect our business, financial condition, and operating results,” Uber said in its filing.